Anne Cubberly loves to dream up new ways to engage people’s minds and spark their imaginations. She believes that all people are innately creative and have a unique perspective to offer. Anne is dedicated to building community through creative expression in Hartford, Connecticut and beyond. Her work with communities includes 12 years and counting as a guest artist at the Cleveland Museum of Art’s Parade the Circle. At “Parade,” Anne works alongside local and international artists, exchanging ideas and culture under a tent. 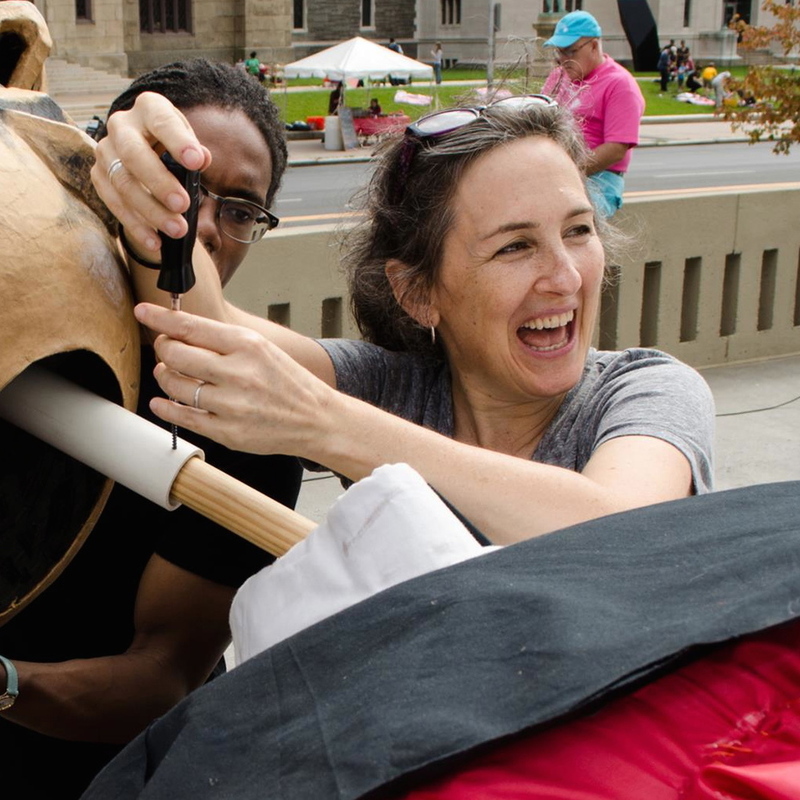 In 2007, Anne and Steve Mitchell began the Parade Project at Asylum Hill Congregational Church in Hartford, Connecticut. This free 5 day event invites Asylum Hill neighborhood families to create costumes, props, giant puppets and to learn stilt walking. The experience culminates in an explosion of color, music and celebration as they parade through the neighborhood to the Sigourney Park Festival. Night Fall was born in 2011, after years of dreaming about a performance that would celebrate the riches of Hartford’s landscape, artists, community and giant puppets. Cubberly, LB Muñoz, and Steve Mitchell have dedicated themselves to creating this free yearly event which supports and connects local artists and neighbors in a spectacle of giant puppets, stilters, dancers, singers, and community. LB Muñoz is a consummate host and event planner whose greatest joy is creating experiences that bring talented artist, performers, and innovators together to create, cultivate meaningful relationships with audiences, and inspire communities through art. She is passionate about education, social justice and personal responsibility and sees art as an accessible and essential tool for understanding and contributing to world around us. A gifted communicator, LB is a diversity educator for the Anti-Defamation League where she works to empower students and communities to come together through embracing their differences. A Greater Hartford native, LB traveled extensively through the US, studying Theater at Emerson College before finishing her studies in Education at the University of North Texas. Her passion for food and wine led her to a corporate trainer position for one of the nation’s premiere fine-dining empires before returning to Hartford to become a restaurant manager for the Max Group. Love of the contemporary art world and event planning combined to bring LB to Real Art Ways in 2007. There, her organizational skills, hospitality expertise and fascination with spectacle led her to create the Odd Ball as well as many other outrageous and successful fundraisers, performances and celebrations. LB is on the Board of Directors and is Production Manager of Anne Cubberly’s gift to Hartford, the annual celebration Night Fall. LB and Anne were coerced into working with each other 6 years ago. LB hasn’t stopped being grateful.